Takeaway: Corrosive impurities in the synthesis gas include carbon dioxide, hydrogen sulfide, sulfur dioxide and sulfur trioxide, which can arise during the gasification process. Pre-combustion refers to a process where fossil fuels (coal, oil and natural gas), biomass or carbonaceous materials are gasified either in the presence of steam (steam reforming) as shown in Equation 1 or in the presence of limited oxygen (partial oxidation) as shown in Equation 2. The aim is to produce synthesis gas or syngas, which is a combination of carbon monoxide (CO) and hydrogen (H2) as displayed in Figure 1. In an optimized synthetic gas production process, the heat generated through partial oxidation is used for steam reforming. This optimized process is known as autothermal reforming. Possible corrosive impurities in the synthesis gas include but are not limited to carbon dioxide (CO2) and hydrogen sulfide (H2S) which come as impurities in the feed. Some additional corrosive impurities such as sulfur dioxide (SO2) and sulfur trioxide (SO3) can arise by the interaction of some of these impurities (e.g., H2S in natural gas or sulfur in coal) with oxygen (O2) during the gasification process, as shown in Equations 3, 4, 5. Figure 1. Pre-combustion process for H2 production integrated with CO2 capture. Synthesis gas is important because it is a precursor for several liquid fuels such as dimethylether (DME), methanol, gasoline, diesel and the clean gaseous fuel hydrogen. (Background reading is available in the article The 6 Corrosive Components That Can Be Found in Crude Oil.) 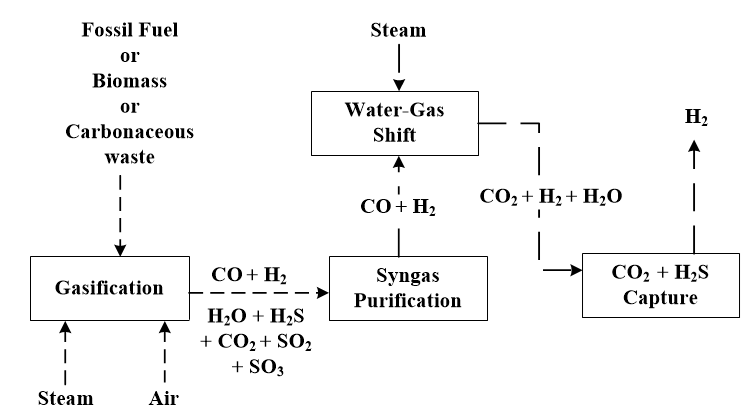 In the hydrogen production route, the purified synthesis gas is sent to a water-gas shift reactor where CO is converted to CO 2 and more H2 is produced (Equation 6). The H 2 and CO2 mixture (with trace amounts of H 2S) is sent to a H2S and CO2 capture unit (acid gas capture unit) where high purity H2 is produced (Figure 1). The use of H2 for electricity generation can be said to be a clean process because it only produces water (H2O) as a waste product (Equation 7). Corrosion during pre-combustion H2 production can be accelerated by the very high temperatures in the gasifier (1200oC to 1500oC for partial oxidation; 850oC to 950oC for steam reforming) and water-gas shift reactor (200oC to 500oC). The presence of corrosive gases (CO2, H2S, SO2 and SO3) and water vapor will trigger severe corrosion. The H2 that is produced is another huge source of corrosion due to the possibility of hydrogen embrittlement. (Get a quick understanding in An Introduction to Hydrogen Embrittlement.) Corrosion induced by H2 occurs when atomic hydrogen diffuses into the surrounding metal (in most cases stainless steel), hence making it brittle and leading to subsequent fracture. Once H2 atoms diffuse slowly into the metal, they come together to generate pressure inside the metal. This pressure will rise with time and cause reduction in the metal's ductility and tensile strength, leading to hydrogen-induced cracking (HIC). Considering that H2 solubility increases with temperature, concentration and pressure, this makes hydrogen-induced cracking a big concern in pre-combustion hydrogen production process plants. Though there are several approaches for minimizing hydrogen embrittlement, reducing hydrogen levels and its contact with the metal are common approaches. One of the common methods of reducing hydrogen embrittlement is by avoiding the H2 source; however, since H2 is the major product of any pre-combustion process plant, this will not be a recommended solution. On the other hand, heat treatment of the metal can release the diffused H2 to the surface of the metal through a process known as "baking." However, it is not always recommended to perform heat treatment to metals while they are in operation. Therefore, this makes material selection the most often recommended approach to minimize hydrogen embrittlement. Once the right metal is selected for the H2 production process, hydrogen embrittlement will be greatly reduced while the metal retains its mechanical properties and prolonged operating life. The most common sulfur compounds present in the synthesis gas are H2S, SO2 and SO3 as displayed in Figure 1. As part of the synthetic gas purification, the raw syngas is cooled or quenched (in quench towers using spray water) in order to condense most of the water vapor and prevent most impurities from entering the water-gas shift reactor. This process allows SO2 and SO3 to interact with the condensed water leading to the formation of corrosive sulfurous acid and sulfuric acid according to Equations 8 and 9. The presence of these liquid acids will lead to acid attack on the surface of the metal. Though sulfuric acid will react with iron (Fe) in carbon steel to form a protective layer (ferrous sulfate, FeSO4) as shown in Equation 10, this FeSO4 over time will dissolve in H2SO4, leaving the metal unprotected and vulnerable to an increased corrosion rate. In the presence of condensed water vapor or quenched synthesis gas, H2S will dissociate according to Equation 11 to produce atomic hydrogen. This atomic hydrogen will diffuse into the cavities of the metals and reduce its tensile strength and other mechanical properties. This is another source of hydrogen embrittlement or hydrogen-induced cracking. In addition, the H2S itself reacts with iron to form a temporary protective layer (Iron(II) sulfide, FeS) on the metal (Equation 12). This FeS is not stable, and in the presence of hydrogen will break down and H2S is produced again (Equation 13). The FeS breakdown due to H2 will be rapid because of the high concentration of H2 in the synthesis gas. One of the best approaches to mitigate corrosion arising from sulfur compounds is to avoid the impurities (H2S and S) in the feed from entering the gasifier. This can be achieved by coal desulfurization (sulfur removal from coal) and by H2S capture from natural gas. Unlike a post-combustion process plant where the CO2 concentration ranges from 4% to 15%, the pre-combustion process for H2 production can have a CO2 concentration up to 40% at the exit of the water-gas shift reactor. This increases the possibilities of carbonic acid formation and its subsequent dissociation (Equations 14, 15, 16) due to the presence of water vapor in the process stream (Figure 1). As a result it will give rise to corrosion along the piping from the water-gas shift reactor to the acid gas capture unit. If coal is used as feed to the gasifier, then coal desulfurisation should be conducted. Blending low sulfur coals with high sulfur coals can serve as a possible solution. If natural gas is used as the gasifier feed, then H2S and CO2 capture should be implemented. Applying corrosion inhibitors will help hinder the corrosive reactions. The use of protective coatings and linings will help minimize contact between the metal and the corrosive environment. The right material (metal) selection will withstand the corrosive environment while maintaining an extended service life. Regular monitoring (e.g., pH monitoring) of liquid streams, online testing (e.g., ultrasonic methods) and liquid sample analysis (e.g., for Fe content) will provide reliable information on the possibility of corrosion.